The architecture of the postwar era rejected traditional historical ideas and reflected a relentless quest for new forms of expression. This artist’s studio is an excellent example of Mid-Twentieth Century Modern Movement design by noted Victoria architect Alan Hodgson. This new type of house repudiated historical ornament, provided a transparent expression of internal and external structure and embraced industrialized mass-production techniques. This house is composed of exposed heavy timber posts and beams, large wall planes with broad expanses of rectangular windows, and sloping roofs. The windows maximize views and natural light, and integrate interior and exterior spaces. Exterior finishes include vertical wood siding, wood windows, sliding wood doors, and a large concrete block chimney. The large volumetric interior studio space, lit by skylights, is oriented to the harbour. Elza Mayhew’s sculptures dominated the open plan studio on the main floor. There was a small upper floor apartment. Mr. Hodgson was one of the restoration architects for the B.C. Legislative Building in 1973, the Masonic Temple on Douglas St and the rehabilitation of and addition to the McPherson Theatre in 1965. His modern buildings include St. John’s Anglican Cathedral Seniors Infill Housing, the Education and Music buildings at the University of Victoria, the Island Dairies Plant, and the Foster House, Sooke. From 1967 to 1970 he taught at the University of British Columbia as an Associate Professor of Design. He was awarded a National Heritage Award by Heritage Canada Foundation in 1981. 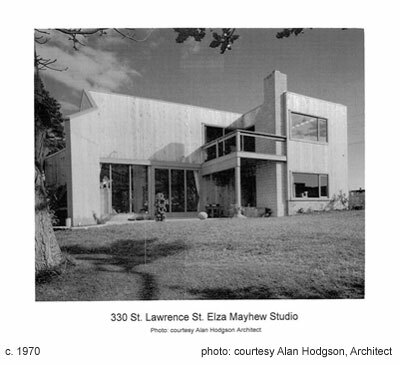 The studio was built for Elza Mayhew (1916-2004), one of Canada’s most famous modern artists and sculptors. Born in Victoria, she trained under Jan Zach (218-220 St. Andrews St, James Bay) in 1955-58 and received a Masters of Fine Arts in sculpture from the University of Oregon in 1963. With fellow artist Harold Town, she represented Canada at the Venice Biennale in 1964. Mayhew was a member of the Royal Canadian Academy and her work is found in the collections of the Art Gallery of Greater Victoria (1040 Moss St, Rockland), the National Gallery of Canada, Simon Fraser University, the University of Victoria and internationally.